Mandy Shoger is new to the Methow Valley. A longtime fan of the North Cascades, Mandy has been dreaming about moving to the area for years and has finally moved her ceramics practice, Foxtail Pottery, to TwispWorks. 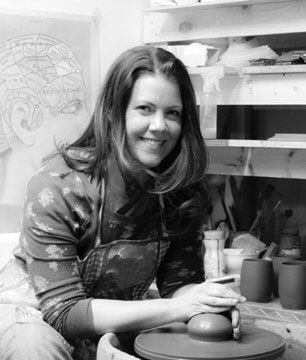 Mandy originally earned a BFA in 2001 with a focus in oil painting, but was lured by the meditative qualities of clay work soon after graduating college. She has been growing her functional ceramics business in Seattle for several years, and enjoys working with clients near and far to create dinnerware that they can use every day. Her work is carried in several shops and galleries across the country and online at www.foxtailpottery.com. She enjoys straddling the design line between modern and rustic, using bold patterns inspired by architecture and textiles from around the world. Mandy is excited that this new opportunity will give her more space to grow and evolve, and draw from the natural beauty of the people and landscapes found in the valley. Be sure to stop by her studio in building number 9 and say hello!